//*ads *// It was really sunny on sunday, so me & Jack decided to drive to Cardiff for a little mooch/shop. They have an Illamasqua counter in the Debenhams there, so OBVIOUSLY i was going to check out some of the products as i have been waiting SO patiently to see in the flesh. But first, i'll go through other things i bought. The pearl necklaces were both Primarni. One on the left was £3 & the one on the right was £2. Can't go wrong with pearls..every girl should own some. 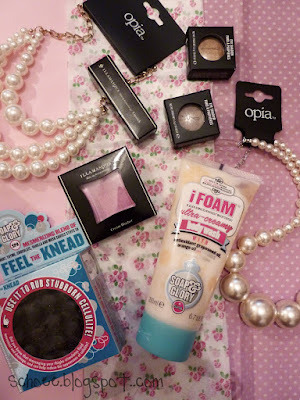 Soap & Glory - Feel the Knead This is, quite possibly, my favourite S&G product to date. In all honesty, i bought this because it intrigued me. Ever seen soap shaped like this? It smells amaaazing. Really fresh smelling. When i used this, i was pleasantly surprised. 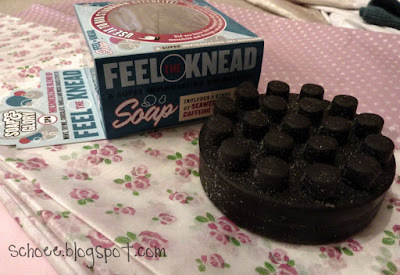 It seemed to exfoliate, lather and leave my skin so smooth, as well as massage away all the cellulite. Haha, okay the cellulite wasn't gone after my bath but its nice to think this might actually budge it if used religiously. I'm actually looking forward to my next bath so i can use this again. 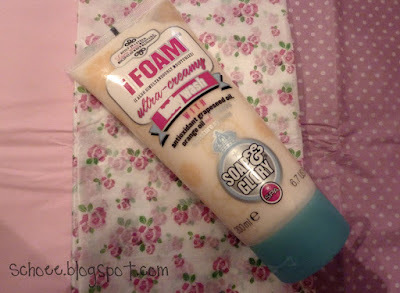 Soap & Glory - I-Foam Body wash I took one sniff of this and threw it in my basket. Not alot to say on this one in all honesty, it smells bleddy amazing, lathers amazing & just does everything it says on the bottle. But when i got to the actual counter, i was so overwhelmed with all the different colours and the girl constantly trying to paint my face i didnt really take it all in properly. So i went straight to the lippies and this one took my fancy. 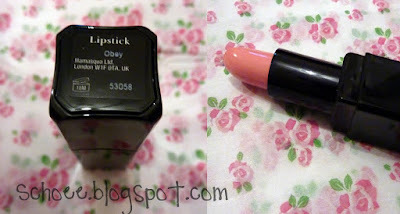 It looks gorgeous on, a colour i definitely dont have and it lasted SO long on my lips. So far i am very impressed with the Illamasqua Lipsticks. 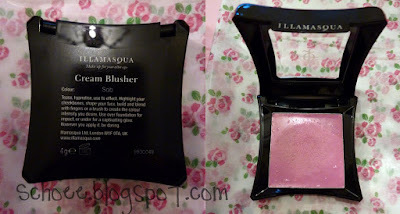 Illamasqua Cream Blusher - Sob This was the cream blush that really stood out to me. It is very similar to the powder blush in "Katie" and the MA put both on each of my cheeks and we both agreed that the cream blush looks alot more natural on me. I wore it the other day, and it lasted me HOURS. Something the Mac cream blushes FAIL miserably to do on my skin. I need more of these in my collection. They are so worth the money! Very generously, Jack bought me both Illamasqua products. He's always so sneaky, and when i go to pay, he jumps in & shoves his card in the machine. 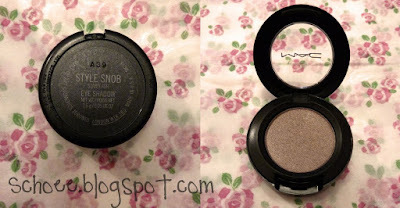 Mac Eyeshadow - Style Snob This eyeshadow is part of the "Love that look" collection in Mac at the moment. These shadows are amazing, i love the Starflash finish & can only urge you all to check it out. I want almost all of the shadows, but being very good, i came away with just one. I didn't own this shadow...& i couldnt believe i didn't own it. It was always one of those shadows i'd swatch on my hand and then just leave the shop over and over and over. 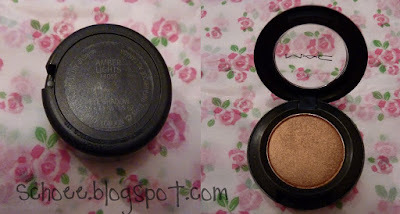 I decided on buying it this time as when i swatched it, Jack loved the colour & really wanted me to wear it. So that is my little shopping load. It's not much, but i thought i'd share my first experiences with Illamasqua up close. Although, im pretty sure they didn't have the whole range..it didn't seem like they did, unless i was so in ore i totally misjudged the amount. The girl was really nice, and gave me a mini makeover.